What is the world coming to these days? 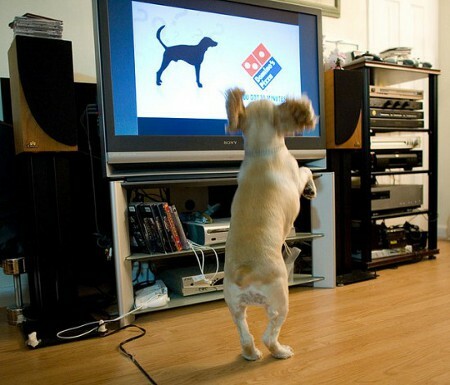 There are dog spas, dog restaurants, and now, a new 24-hour channel which targets our canine friends – perfect for keeping them “entertained” whenever Fido’s owner leaves the house. Do you think that it is rather weird for us to think of dogs as humans, having the same kind of wants and needs that we have? Just take a look at the amount of accessories that pet stores carry for dogs these days – no longer is a simple ball or stick good enough. I personally feel that giving your pooch adequate exercise and enough mental stimulation for the day through a daily walk is more than sufficient, and a TV is not really going to help turn your pooch into Lassie overnight. Well, having said that, it did not stop the DOGTV channel from being launched on Time Warner and Cox digital cable systems last week. The concept remains extremely new, and it remains to be seen if pets will really be interested in the channel or not. It is hoped that this channel creates a soothing and relaxing environment for dogs, but this is another avenue for dog owners to be fleeced. Source, Image courtesy of Chris Cho. I want this channel. I always feel guilty when I leave the boys home alone for a long period of time.